Our stylish 4-seater Mia table features exquisite detailing including a rounded braid centre and an expanding spiral lattice. 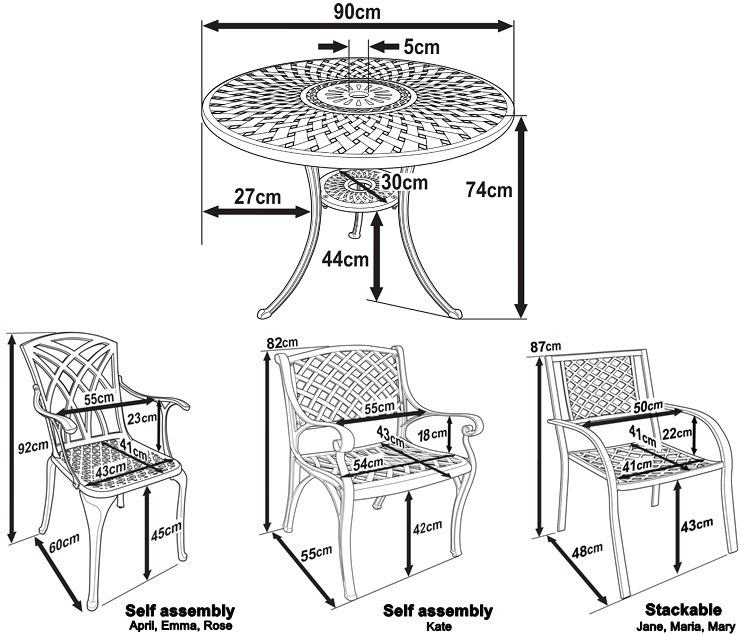 Place this table in a sunny corner spot or let it take centre stage in your garden. Moving this table around to find the perfect home for it is also hassle free as this table weighs a mere 10kg. You are sure to enjoy many meals sat around the Mia table basking in the sun. 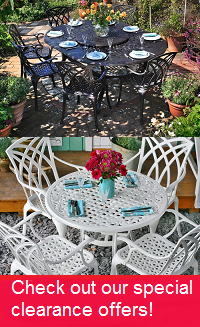 Our Mia table & 4 chair set in White will turn any garden into an idyllic outdoor seating and dining area, perfect for entertaining guests. For a time-worn effect that remains strong throughout the ages, pop on over to the Mia in Antique Bronze, or its charming sister in Slate Grey. Excellent quality furniture. Ease of ordering and delivery time second to none. We are delighted and would happily recommend Lazy Susan anytime. All went very smoothly thank you. A couple of minor spots on furniture where paint not perfect, but otherwise very pleased. Ordering process, delivery and article are o.k. Particularly impressive was the prompt delivery. The quality and beauty of the chairs and the table were especially surprising. We found our order was dealt with efficiently and despatched within 8 days. We have not assembled the table and chairs as yet, but all appears to be satisfactory We would be prepared to recommend your company to other consumers. Easy to use website. The delivery was really fast - within a week to France from the UK and even arrived on the day it was expected to - which is very unusual for French deliveries! Can't comment on the item yet though as it's still in the box. Although the furniture was in excellent condition the boxing of the table was badly damaged so I would suggest that your delivery partners are more careful when delivering. Excellent quality furniture. Ease of ordering and delivery time second to none. In today's climate where this is not the norm you are to be commended. Efficient and prompt delivery. Very pleased with the furniture now it's all together! Chairs are very comfortable and the furniture a lovely white! I'd recommend Lazy Susan to anyone.